Waldorf High School tuition covers all the requirements of the SA Schools syllabus, but also offers a richer depth of learning. 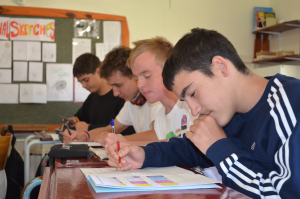 Regular tests and reports form part of the continuous assessment of the progress of each pupil. Our goal is to develop each pupil's faculties of social, artistic, critical and creative abilities as much as the academic. Such a person, we believe, will be more widely prepared for life and for a contribution to society. What is done in the High School is a natural complement to the groundwork in the Nursery and Primary Schools. It represents the fruit of all the growth, nourishment and care fostered on the younger child. Waldorf Education is conceived of as a whole, as an organic process. The child's living imagination, so carefully nurtured in the Primary School, grows organically into the realm of conceptual thought. Themes that are handled in the Primary Main Lessons are recapitulated more consciously in the High School where the development of judgement and the challenges and changes of puberty and adolescence can be met with all the richness of the Waldorf approach. The various aspects of the curriculum provide a stiff challenge to the individual pupil who has to display a larger measure of independence and originality of thinking than is normally the case at secondary school level. There is much project work in which individual research and creative presentation is required. Pupils are continually encouraged to take their own initiatives in all their activities, to develop their own interest areas and to express the originality of their own discoveries and insights. In these ways, self-confidence is nurtured as are social and communication skills. In addition, of course, the content of the Main Lessons is specifically designed to meet the needs of the growing personality. Click on sections below for more detail on each year. The pupils are into adolescence; bodily and psychological changes are well under way. The world of ideas begins to take on meaning for the young adolescent and the critical faculties are noticeably sharper; the accepted framework (rules particularly!) are scrutinised critically…The emergence of an independent life of feeling presents a challenge to parents and teachers – how to accompany the young person during the emancipation of an independent inner life of thinking, feeling and intention without being overwhelmed by the waves of emotions. The state of crisis is part of a development. Girls may spend much time and energy discussing and sharing their feelings and the social and emotional aspects of life in small, cohesive groups. Boys can appear uncommunicative, emotionally illiterate and tend to be brash or sullen. Regardless of the outer manifestations, both genders now stand before new and unknown vistas with sharpening minds, tender hearts and limbs that are not quite balanced. By the end of Grade 8, the students are already searching for new authorities and role models. The overriding theme is working with the world’s laws by conversing with them and, in doing so, finding one’s own voice. The students experience how knowledge makes one capable of forming appropriate judgements and how forming judgements leads to new questions. In Grade 8, because the feeling world is often overwhelmingly unstable, the Curriculum concentrates on matters of structure that can contain and strengthen, and the chaotic forces that push against that. In Geology, the class looks at plate tectonics, mountain ranges and volcanoes. In Handwork, young people learn to bend cane into the structure of a basket. In History, living through the Industrial Revolution provides a rich experience of the change that machines brought to people’s lives. This links in with the study of pressure and applied power in Physics. In Chemistry, students look at the solid metals. In Biology, we study the skeleton that provides the framework for the human body. In Afrikaans we go back to the very beginnings and imagine how the very first colonial Europeans survived on this soil. We build traps, find water and work out how to make fire and create shelter for both the short and long term. We look at recent history and the displacement of the communities of District Six and their culture. The five platonic solids are the cornerstones of all that is around us. They form the foundation to all that is organic and living. They hold within them the magic of mathematics and the ‘Fibonacci’s Series’. This is where precision work and creativity come together. Within this skeletal structure lies the answer to all construction. The bone is the very foundation stone to a body that can then become flexible and move. We look at the differing bones, their build and their function and compare them to animal bones. ENGLISH: Topics from the era of the Industrial Revolution and its consequences. Epic poetry and drama. Intonation, meter and quality of sounds. Simile and metaphor in composition and poetry. Further grammar. MATHEMATICS: Formal introduction to Algebra: integers (negative numbers); first degree equations and problemsolving; roots; simple factorising; basic laws of exponents; ratio and proportion. Geometry: derivation of area formulae and the discovery of n; application of formulae; properties of triangles; exploration of other polygons; Theorem of Pythagoras; volumes of solids; Platonic solids; figure transformations (change of form with preservation of area); parallel lines. HISTORY: The Industrial Revolution in Europe and South Africa. GEOGRAPHY: Mountains, rivers and rocks. An introduction to Geology. Continental Drift. Structure and functions of principal economic areas in South Africa. Resources, economics and conservation. PHYSICS: Basic mechanics. Heat and power. CHEMISTRY: The metals. Carbohydrates, sugar, protein and fats. BIOLOGY: Skeletal anatomy of man. Biochemistry as related to human body with emphasis on sugar, carbohydrates, proteins and fats. SECOND AND THIRD LANGUAGES : Afrikaans and Xhosa continued with detailed exercises in grammar. ARTS: History : The origin of Art. Prehistoric forms. The elements and terminology of Art. Practical: Black and white drawing. Perspective drawing. Clay modelling. Platonic forms and transformations. Eurythmy, singing and music. TECHNOLOGY: Woodwork: Elementary joinery. Sewing : designing and making a piece of clothing using machine. Metalwork.. Copper beating. Basket weaving elementary exercises. Adults should provide the adolescents with new perspectives, particularly by directing their attention into the world. Young people need to learn how to formulate their own points of view while accepting that others may see the world differently. At this age it is important for the young person to form his/her individual judgement and to take on social responsibilities. Adolescents should see the world as a place in which the human being is a striving and ethical individual. The year begins with the Welcome Tea on the Sunday before school starts. As the young people start to gather, you see how they’ve grown over the holidays: they are distinctly taller; faces and voices have changed. Most are a bit shy and quite nervous (‘is this outfit OK? Will my parents embarrass me?’) But they relax when they greet all their friends and rejoice in reconnecting and catching up with news. They have an opportunity to orientate themselves in the classroom, and meet all the classmates who will be sharing their journey this year. Then it is the first day of high school and there is the apprehension again (‘what will the Grade 9s and 10s be like? Am I dressed right? And are we going to be overwhelmed with work?’) But as the day progresses, and the lessons turn out to be quite normal and reassuring, they relax and get to know their new classmates. This is mostly the pattern of the year: there is much that is new and challenging, both academically and socially, but there is also a structure that supports them effectively. It is important at this age to meet the ‘riddles of the world’ – the big unsolved questions – and to take up a challenge of some magnitude. This year, for the first time, we have asked the Grade 8s to undertake a six-month project of their own choice. This can be to help animals, do outreach work to people in need, learn a skill, make something significant, and do in-depth research… The choices are very wide. They will be working regularly on their projects – outside of school hours - throughout the year, and they will present these to their parents at the end of November. There is much excitement and enthusiasm in the class as they narrow down their choices and start their journals. Life as a 13-year-old is often a rollercoaster ride. In a way they are starting to create their adult selves, and take their cues more from friends than from adults. And so the questions of ‘Who am I? What do I believe in? What is important to me?’ underlie an exciting and scary process of reinventing themselves as young adults. And so we can be sure that they are well equipped to deal with this challenging year. This is a time of turmoil when old values and role models are questioned and often found to be wanting. The student’s emotions roar the extremes of love and hate, anger and lethargy, and they often feel powerless to control them. Through this chaos comes a strong sense of identity. It is a challenging time for all. However, there is an emotional freshness and directness which is enjoyed by all who teach them. Now the third seven year cycle is entered – the age of intellectual development. They are no longer satisfied to feel the mood of something, but rather they yearn to understand why it is so and how it is connected to other aspects of their world. There is a strong quest for truth and deep understanding. The body of a 15 year-old is extremely heavy, and apparently unable to counterbalance the Earth’s gravitational pull. Head, shoulders, hips all strive to be horizontal, whether in a sitting or a standing position. But as this downward movement occurs, there is a balancing upward growth of self. Through puberty and a sexual awakening they experience their bodies in all their individuality for the first time. This is a painful awareness of their physicality in a very emotional way. It is exciting and attractive, yet can quickly lead to feelings of powerlessness against body and emotions: Feelings of ‘my body and my emotions are not myself ’.Teachers work to create a balance between giving expression to these emotions and holding them in check, not allowing these extreme feelings to govern. The focus of the Grade 9 year is the production of a full length Shakespeare play in which each student is given a main part. The Curriculum is designed to mirror the experiences of the 15 year-old. It feeds the striving for truth, deep understanding, and self-knowledge, often by studying opposite processes and connecting them with the whole. The whole represents the balanced self. For example: in Chemistry, the opposite chemical reactions of respiration and combustion which support all life on Earth are used as a gateway to study organic chemistry – the cycle of carbon in living matter from sugar through alcohol, organic acids and finally ether and esters. In Geography, the movement of the tectonic plates is studied: plate convergence and separation, how this shapes the Earth and the force that drives it. In History, they learn about the French Revolution, from the seeds of social unrest to the full expression of the revolting masses, and the impact this had on social order across Europe. This marvellously mirrors their own personal revolution. Throughout the curriculum there is an emphasis on biographies, the personal life stories of the men and women who shaped the world. This connects with the 15 year-old’s own sense of personal destiny. ENGLISH: Classics with focus on Shakespeare and production of a Shakespeare play. Continuation of grammar. Literary aspects f romanticism, rationalism and sentimentalism. Humour. Presentations and declamation. MATHEMATICS: Special products and factorising; more complex first degree equations and problem-solving; irrational numbers; scientific notation; consolidation of Class 8 Algebra; the Cartesian co-ordinate system; introduction to concept of infinity; projective generation of forms; duality; conic sections (circle, ellipse, parabola, hyperbola) as related to infinity; properties of quadrilaterals; parallel lines; congruency of triangles (leading to formal geometry). HISTORY: History of Nationalism. The French and American Revolutions. Biographies of historical personalities in context. Nationalism in SA. GEOGRAPHY: Geology and geomorphology. The forces shaping the earth tectonic and denudational forces.. Economic relations in Africa. BIOLOGY: Anatomy and physiology of blood circulation and respiration. SECOND AND THIRD LANGUAGES : Revision of grammar. Study setwork. Recitation and developing use of idiomatic expressions. ARTS: History : Comparisons of differences between Greek and Roman, Northern and Southern Renaissance - the Fathers of modern Art. Practical: More black and white and basic exercises in free form colour compositions. Clay modelling. Concave/convex forms. Eurythmy, singing and music. TECHNOLOGY: Woodwork : more advanced constructions. Metalwork : Iron forging. Basket weaving: more advanced constructions. • In the midst of the turmoil, a solid, calm presence from parents (not always easy) is the best ballast in the storm. • Remember that they are learning (which takes time). • Try not to judge their generation. • Encourage and praise the positive. • Be genuinely interested in their lives. • Use lots of humour (this can really let the sun shine through). • Spend time with them. • Most importantly of all, make sure that they experience and know they are appreciated, supported and loved by you. Michael Oak, in true Waldorf tradition, offers a rich treasure trove of plays. Parents in Grade 2 watch the fledgling performances of animal stories from Aesop’s fables. In Grade 3, they see Joseph and his multi-coloured coat; in Grade 4, Thor and his hammer; in Grade 5, the adventures of Gilgamesh, and so on. All of these plays bring the main lesson stories to life in the imagination. There is no high-powered role-play here but rather the accent is on the speech – often alliterative choral verse- speaking. The structure of the plays becomes more emphasised in Grade 6 and then, in Grade 7, as part of the finale in primary school, there is a more challenging performance – sometimes even a high-calibre musical like Oliver Twist or The Magic Flute. In the high school, drama continues to be concerned with the working of the imagination, but there is now a real emphasis on the discipline of craftsmanship. Here theatre provides the medium to develop skills and discipline in an art form that will assist in the communication of one’s ideas and experiences to others, as well as the self-confidence this brings. In Grade 9, Michael Oak has a long tradition of highly skilled and entertaining full-scale Shakespeare productions. In Grade 10 the students study and perform a Greek Tragedy which is completely different from the Shakespeare Play. The students in Class 12 present their own highly competent productions of modern plays. Drama is also a subject option for matric and is studied from Grade 11. Theatre is the most visible and structured form of drama, but let us not forget there is also much educational drama that takes place in the classrooms without a special audience and which does not necessarily involve teaching children how to act. It is concerned with opportunities for invention and expression where what has been imparted factually can be brought to life through movement and speech in order to enliven and enhance the personal experience of different phenomena and subjects. But back to the stage… and Michael Oak’s Shakespeare plays. Over the years there have been one-off productions of ‘serious’ plays such as Cymbeline, Macbeth, A Winter’s Tale; but it is the romantic comedies that keep coming back. Two terms of rehearsal and a natural bent for fun have ensured that these are the Grade 9 favourites: A Midsummer Night’s Dream, Twelfth Night, As You Like It, The Comedy of Errors, The Tempest and The Two Gentlemen of Verona. And always, there are the enthralled front rows of children who, as they raise through the class levels, not only have Shakespeare as a second language, but who, themselves, can hardly wait to get to Grade 9 to perform a play themselves! Perhaps they sense the central role it plays in the lives and experience of the Grade 9 students. Certainly, year after year, one sees how the drama experience assists the 14/15-year- olds with moving into a new and expanded sense of self. Like other non-exam oriented activities in the multi-textured richness of a Waldorf education, the Shakespeare play may not contribute directly to high exam marks (though this is debatable), but it is clear that the real richness and reward is a permanent inner one – which has to do with the growth and expansion of the students’ human-beingness. In this phase the young person enters a pool of relative calm after the rapids and white waters of Grade 9. There is a marked change and a much clearer ability to see things in perspective, to recognise the grey areas and appreciate the differences. Balance becomes the undertone for this year. This new maturity brings a deeper thinking capacity and the tension between opposites so strongly felt in the previous phase gives way to a sense for process and transformation over time. Comparative and process thinking – i.e. how one thing relates to the other, how parts work together in the context of the whole, how forms develop, and how substance is transformed – underlie the subjects of Grade 10. Physically, the 16-year-old is experiencing a consolidation, and emotionally the young person is much more at peace with the physiological changes that have recently flooded in. Emotionally they are more adjusted and balanced in their responses. Existential questions become more pressing as they move away from the unavoidable. Earlier self-absorption and the question of truth which is the undertone for the High School years becomes a deeper issue. The Curriculum covers topics that the more mature student can appreciate. With the new objectivity, we can return to deep themes covered in the Primary School. For instance, we go back to the Ancient cultures in Grade 10, where a much deeper understanding and appreciation is now possible. The journey travelled can now be viewed from a high vantage point. In literature The Odyssey by Homer stands as a literary monument at the beginning of Western civilisation. The epic throws light on Greek consciousness while simultaneously revealing how relevant it can still be for a modern person. In light of the underlying theme of balance, Chemistry studies acids and bases and salts. That such volatile and caustic concentrated opposites are transformed in uniting to neutral salt as a precipitate is a wonder and can now be understood with clearer concepts. Similarly, the Fine Arts, including Eurythmy, reverberate with experiences of balance. The Grade 10 Geometry block focuses on Conic sections. The conic section curves are first discovered as loci of fixed distances and drawn as curves of addition and subtraction. Then, these same curves are discovered within cuts of the cone. The introduction of the parabola is followed by a discussion of René Descartes and his methods. The students are then introduced to the Cartesian coordinate plane including the equations for lines, parabolas, circles and ellipses. Trigonometry covers the basic trigonometric relationships of sine, cosine and tangent. Both theoretical and practical triangle problems are studied, with a significant portion of the class devoted to applied trigonometry - field work where the students, using theodolites, complete a survey and create a map. Our study of human physiology focuses on the three principle systems arising from the polarities in the human body with the mediating, balancing rhythmic system of the breath and circulation in the middle. These studies begin with an overview of the reproductive system and embryology. Grade 10 Physics is the study of mechanics. We explore the world of classical mechanics as revealed by Galileo and Newton. This must all be connected with the human being – our personal experience of motion and action. History goes back to prehistoric events and the story of humanity’s gradual learning of technical skills and of the relationship to the land. Developments in technology, culture, religion and government are studied through shifts in human consciousness, beginning with the hunter-gatherer and moving on to the birth of agriculture. We explore the early river valley civilisation of Egypt, the later Nile civilisations and the Iron Age cultures in Africa. The Economic and Management Sciences activities take on a very practical form with job shadowing arranged with local businesses. In addition the Grade 10s have to raise money for the Orange River camp, giving wonderful opportunities for entrepreneurial initiative. The morning begins with a buzz. There are casual greetings as I approach the clusters of animated discussion. Much has happened since we last saw each other and there is a lot to catch up on! I like to begin most Main Lessons with some singing. For fifteen or twenty minutes we sing old favourites as one voice, accompanied by the guitar – a wonderful exercise for this age group. Singing is an activity that awakens us – ready to go into the Main Lesson itself. Wherein there lie the stones. Offers a dwelling to the spirit. In sunlight and in soul light To Thee O spirit of God. Within me may live and grow. The strong iambic rhythm in the morning High School verse is the rhythm for action. ENGLISH: Classic sagas and epics. Medieval lyrics. Renaissance. Etymology. Poetry and declamation. MATHEMATICS: Factorising leading to complex algebraic fractions and equations: literal equations; inequalities; simultaneous equations and problem- solving; functions: linear, quadratic (parabola), circle and hyperbola; expansion of the laws of exponents; permutations and combinations; probability; use of scientific calculator; formal geometry; trigonometry and land-surveying. HISTORY: Ancient civilisations. Archaeology and the rise of cities. Early African cultures. Developments from nomadic to settled existence. GEOGRAPHY: Climatology, world pressure systems, principles of Meteorology. The 'living' qualities of the Earth. Sea currents. Crustal structure. PHYSICS: Movement Mechanics of motion. CHEMISTRY: Inorganic chemistry. Acid-base and oxidation-reduction reactions. BIOLOGY: Nervous, excretory, endocrine and digestive systems. Explore threefold activity of thinking, feeling and willing. SECOND AND THIRD LANGUAGES : Further development of competency. ARTS: History : Explorations of periods from Gothic to Modem Art. The study of aesthetics. Practical : Figure drawing. Portraits. More advanced Perspective Drawing. Modelling. Exercises in metamorphosis. Eurythmy, singing and music. TECHNOLOGY: Woodwork: fine joinery. Spinning and weaving. Production of yam and basic fabrics. Metalwork : relief work, and copper raising. Parents can support their child at home by allowing more independence while being really conscious of their friendships and activities. Showing positive interest and involvement with the ‘who, what and when’ in their social life is an expression of parental responsibility and love. You are still the adult in the relationship and must make adult decisions that will not always be popular, but open communication and clear understanding of expectations help build trust and can prevent many frustrations and misunderstandings - write them down if it helps. Realistic affirmation is always far more helpful than anxious counsel. Contributing to the work and welfare of the family is important - creating rhythm and routines within the family and within reasonable boundaries. Doing things together - playing cards, walks, surfing, quality time in outings - all provide important nourishment for everyone involved, but please don't embarrass them by trying to be a teenager, particularly in front of their peers. The curriculum takes into full consideration the further development of the adolescent, as well as the achievement of a high standard in respect of matriculation requirements. This Grail Quest saga, written in the Middle Ages, has surprising relevance for the 17-year-old. As the youngsters sense their own need to undertake their own life-tasks, responsibilities and destiny, Parzival echoes this search in his undertaking of a mighty and timeless quest. There is a high and noble adventure, with trials to be endured and achievement to be won by all who seek the Ideal. Parzival discovers the need for sacrifice and the placing of his talents in the service of others. The Grade 11 students, endowed with budding idealism, are “ideally” suited to appreciate what Parzival must go through. This main lesson is accompanied by a camp experience where the youngsters, as a group, set out on an adventure quest of their own, involving a long and challenging journey. The students have the opportunity to spend approximately three weeks working in some sort of social outreach institution, for example: working with orphans, the aged, the physically or mentally disabled, homeless people etc. These experiences open up questions about society’s values and responsibilities, and foster a deep understanding and respect for what it takes to be a carer. Projective Geometry in Grade 11 is a unique Waldorf experience that moves from the traditional, classical geometry to a fluid, modern paradigm in which pure mathematical relationships are expressed in beautiful harmonic forms. For both mathematicians and non-mathematicians it provides amazing glimpses into a mathematical world where measurement is secondary. This theme explores the transition from the quests of faith to the quests of reason. It covers journeys across traditional borders, bringing new, enlightening and challenging influences, as well as chivalry, community and deep tradition. We will explore the following: A. The order in nature (statement) and B. Is there order in nature? (question).The gathering of observable phenomena on which to base a view. We will also look at the following: cell study, genetics and ecology. This is all about discovering the deeper aspects of knowledge behind the subject and making the elements of music and speech more conscious as well as discovering some important Greek mythological concepts in relation to space and movement, and applying these to one’s own Eurythmy creative process. Quantitative chemistry is introduced in Grade 11, and with this new approach there are many directions the main lesson could take: radioactivity (The Manhattan Project could be studied), the historical context of nuclear weapons and energy, the scientific puzzle that is homeopathy, and many, many more possibilities. This main lesson deals principally with map projections, cartography and the understanding of atlases in connection with the measuring system. Another exciting topic is Astronomy: working knowledge of the sky and rudiments of astro-navigation. Rudolf Steiner indicated that in Grade 11 one should grapple with the modern discoveries of physics, in particular those based on electromagnetic theory. Some possibilities are: transmitters and transistors, atomic physics (gas emission tubes), cathode rays and x-rays, semi-conductors, diodes and many aspects related to electricity. A Hands-On introduction to computers: After looking at the way computers evolved, we will investigate the fundamental principles of computers in this practical main lesson. Waldorf philosophy stresses education through the arts as a means to a better understanding of the world in which we live. The Grade 9’s have the opportunity to investigate history through studying artists and artworks. Here they have an aesthetic experience suited to their stage of maturity. In Grade 11 the time is ripe to look at history through music. The exploration of medieval, Renaissance, Baroque, Classical, Romantic, and Modern musical styles leads the students to a deeper appreciation for the changing times and for the riches of music. The following subjects are covered in the running lessons: English, Afrikaans, Mathematics, Art, Eurythmy, Life Orientation, Craft, Bothmer Gymnastics. Xhosa as a second language will be dealt with on an individual basis. All other languages need to be met through an external tutoring arrangement. In the academic running lessons, we keep abreast of the NSC curriculum, while presenting the content in a manner in line with Waldorf principles. The theme of Grade 12 is synthesis: taking all the parts that we have learned about and seeing how they might come together to make something whole. It is the crowning glory of the Waldorf Curriculum, and at Michael Oak we will offer a full and uncompromised Grade 12. This will culminate in the Grade 12 project presentations at the end of the third term. The fourth term of Class 12 is essentially part of the 13th year: the preparation for matric exams. Thus, choosing subjects only takes place in the fourth term of Grade 12. Before this, all pupils participate in all the subjects in a full Waldorf curriculum. The highlights of the Grade 12 year are the Grade 12 play, and the projects. All pupils participate in the play; there has been no subject specialization at this point. During this process the teacher is an important guiding voice, but the real work of mounting this production is taken on by the students who are usually willing to do whatever it takes to produce a stellar performance. Characters are consciously penetrated with the flowering and newly awakened capacities now at their disposal. The strength gained in facing the audience also helps them to face the future. One of the most triumphant and enriching ways of concluding one’s Waldorf education must undoubtedly be performing a play like this. In Grade 12 the students take on a project of their own choosing. Although they are mentored and guided, they are expected to carry this project on their own. The bulk of the work is done out of school. They need to be motivated; they need to manage themselves and their time. They are required to keep a journal during this time, and also to present their project to the school and community. BIOLOGY -- Genetics and evolution theory. HISTORY -- Modern history (world and South African), comparative aspects of history. ART -- History of architecture: review of development of architecture, organic and functional architecture, materials and techniques used in building, some great architects of our time. CHEMISTRY -- Continuation of quantitative chemistry and its application to our time; manufacturing and environment. Continuation of atomic theory, emission spectra. GEOGRAPHY -- Economic and social geography; world population problems, ethnology, international organisations. PHYSICS -- Acoustics and optics. CLASS 12 PLAYS -- (see above). MATHEMATICS -- The history of mathematics and introduction of advanced mathematics. The goal is to empower young people between the ages of 14 and 25, by providing a balanced, non-competitive framework for self-development that will increase their self-esteem and enhance their capacity to achieve in whatever context they find themselves: enabling them to become responsible active citizens within their communities. The fundamental aim of the programme is to empower young people from all walks of life to believe in themselves, develop new skills, keep physically fit, be of service to others and to challenge themselves. The President's Award offers a holistic, non-formal, non-prescriptive, non-sexist, non-competitive educational programme to young South Africans between the ages of 14 and 25. Matric is an examination syllabus year.It commences in the 4th term of the Grade 12 year, with the selection of specialist subjects. Michael Oak students write the National Senior Certificate. While we do not package subjects, and endeavour to give you as free a choice as possible, please be aware that we need to guide your subject choices to facilitate timetabling. Please note that if you wish to register for a subject for matric that Michael Oak does not offer, it is your responsibility to ensure that the institution offering the subject is appropriately qualified and registered and will take full responsibility for the academic and administrative requirements. Michael Oak will not take any responsibility for this subject. You will also be required to be registered for the subject from Grade 10 (Class 11), and fulfil the Grade 10, Grade 11 and Grade 12 CAPS requirements. As Michael Oak’s High School expands into the Upper High there will be some distinctive shifts in our modus operandi. As our older students prepare to take their place in an adult world, we intend to meaningfully increase the students’ experiences outside the classroom. The Parzival Camp, the Social Practical, The President’s Award (see above), and so on, provide vital experiences of this kind in Grade 11. These, and many other rich and vital experiences, are being planned to grow the social maturity of our High School students and to give them learning experiences additional to those found in the classroom. In the same way that the school found the obvious solution in placing the huge new hall, we are in process of accomplishing the same kind strategy for placing and configuring accommodation for the new High School needs. 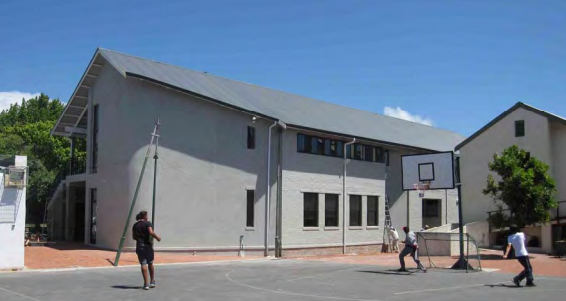 We have completed Phase 1 which includes a high school block with five large classrroms. We are in the process of finalising the details for Phase 2. The precise details of this are in process and will be announced as soon as fitting. We are extremely fortunate in that we will be mentored by two highly experienced and well–respected teachers: Howard Dobson and Michael Merle. Howard Dobson is focuses on the Waldorf curriculum (Grade 11 and 12), and Michael Merle, who currently teaches at Roseway, on the Matric examination syllabus. We include here a brief introduction to each teacher. Richard started out with a scientific training with physics, botany, soil science and animal husbandry. His training was in Biodynamic/ecological farming at Emerson College in Britain. There he had the wonderful opportunity to pursue a special interest in Projective Geometry and did supplementary courses with Olive Whicher who wrote two definitive books on the subject. His years at Emerson College provided a solid grounding in Steiner’s researches. After 12 years farming he took up studies in the arts earning a BA in History and Ancient History. His experience in metalwork, woodwork and bookbinding arose from interest and pure enjoyment. Graham taught matric English, first and second language, and put on plays, in Mitchells Plain state high schools for 7 years in the turbulent 80’s. During this time, his appreciation and study of Waldorf education deepened. In 1990 he was asked to join the pioneer Michael Oak High School which had started the previous year and ever since that, he has been integral to the main lesson teaching program (covering in Grade 8 – the skeleton, the industrial revolution. the physics of atmospheric pressure and heat engines; in Grade 9 – the circulatory system, electromagnetism, the build-up and erosion of mountains, and drama; in Grade 10 – The Iliad and Odyssey by Homer). He has taught the running English lessons in Grade 9 and 10; and running maths lessons in Grade 8 and 9. He has produced 24 annual Shakespeare plays, a highlight of Grade 9. An extra-curricular pursuit of his entails researching the question of who really wrote the works of Shakespeare! Derina taught languages and maths in mainstream schools before becoming a programmer and systems analyst in the mainframe computer world, where she worked for many years. She joined Michael Oak as a mother in the 90's, and subsequently taught Afrikaans in the Primary School for seven years. The Afrikaans plays by Grade 6 were a feature of that time and a fond memory for many. She joined the High School faculty in 2007 as maths teacher, happy to follow a life-long passion for maths. After obtaining her diploma (majoring in painting), Gillian lived in Paris for a year, studying colour etching at the Cité des Artes. For many years she created illustrations for children’s books, during which time she also joined Michael Oak to teach in the High School (on the same day that her daughter started Nursery School). Gillian feels fortunate to have completed the Bridging Polarities Through Art course and is currently attending the in-service Waldorf teacher’s training course. Winifred trained as an Occupational Therapist in UK. She came to South Africa as a volunteer in the early 70s, using her handwork/ craft skills and interest in doing ‘home industries’ on a Mission in KZN. She worked at the General Hospital Hillbrow and in the Adolescent department at Tara Hospital. After spending time in Mocambique; Southern Cape (where she taught pottery to adults at the technikon); and Los Angeles, the Bonds arrived with three children in Cape Town. As an ex-Waldorf pupil of Michael Hall, UK, and encouraged by the diversity of Michael Oak at that time, her children started their schooling here. She ran a Waldorf playgroup while the youngest child was still at home and then took the handwork teacher post at Michael Oak when the high school development was in its infancy. She has enjoyed sharing her wide crafting experience ever since to all ages. Diane has been teaching in the high school since 1995. She teaches the Grade 9s in dance, movement, speech and drama. She is also a director of the annual Shakespeare play. Diane had her first stage performance at the tender age of 5. As an 8-year-old veteran she was offered a bursary to study classical ballet at UCT! She has spent her life and training, one way or another, involved in stage and theatre, dance and dance exercise. Diane did 3 years of Waldorf teacher training at the Centre for Creative Education, also lecturing there in Child Development and Drama. She was part of the pioneer group of teachers at the Gaia Waldorf School. Cal’s undergraduate degree includes Chemistry, Physics, Geography, Geology and Maths as teaching subjects. She is a Waldorf graduate having attended Michael Oak Primary School, before the High School was developed, and Constantia Waldorf for high school with a year at the Stuttgart Waldorf School in Germany. She is attended the in-service training course for Waldorf High School Teachers and is also registered for the Post-graduate Certificate in Education through Unisa. She has taught at Michael Oak for since 2008 (Chemistry, English, Geography). Prior to this she worked as an Environmental Consultant for 10 years (Arup International, Dublin and Ninham Shand, Cape Town). Other interests include English language, she completed a creative writing course and specialised in report writing. She has also taught ballet to both children and adults. Estelle joined Michael Oak at the start of 2012 to teach Afrikaans. Her undergraduate studies include majors in Afrikaans-Nederlands, Psychology, History and Theory of Art, Printmaking and Graphic Design. Her career included positions as teacher, communications officer, staff trainer and map librarian before she joined the non-governmental sector as proposal writer in the mid-1990s. In this position she visited many of Cape Town’s shack settlements to document conditions of poverty for funders, and researched a range of developmental needs, including early childhood education, youth development and human rights education. The demand for impact assessments led to her completing a Monitoring & Evaluation Diploma in 2010. Roy initially qualified as a primary teacher and taught in primary school for nine years, where he taught Physical Education, administered all the sport and coached. He then went to Cape Town High where he has taught for fourteen years. He co-ordinated all the sport, coached athletics, volleyball, cricket, soccer, softball, and led the hiking club. He taught a range of subjects, including Geography, Biology, Mathematics and Computer Applications Technology (as a matric subject). Roy has facilitated several ‘Coming of Age' Camps with Michael Oak’s Grade 10s. He is currently studying for a National Diploma in Information Technology. Roy will be teaches a variety of subjects throughout the high school including Maths, Consumer Studies and History. He is also the High School Sport Facilitator involved in the extra-mural sports programme.